Here in the Consumerist Cave, we’re always amused when a photo or a story makes a complete lap of the newsosphere, and a reader sends it to us having no idea that it originated with us. 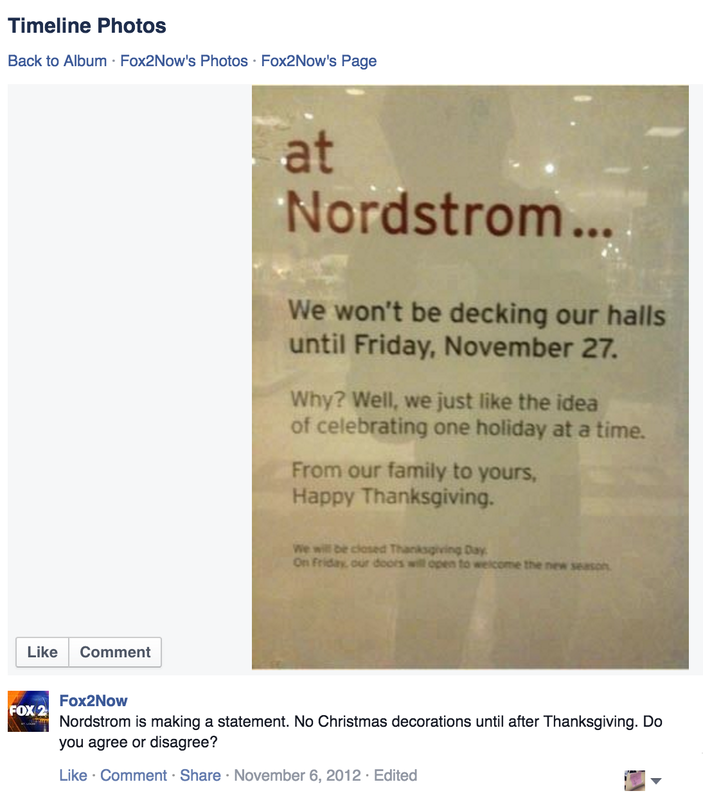 This week, things are starting to get strange, as social media users are sharing and even legitimate news outlets are posting a small, blurry camera phone photo of a sign posted at Nordstrom about their Christmas decorations policy. A photo that we posted six years ago. Nordstrom, you see, has had a long-standing policy that they do not put up any Christmas decorations before Thanksgiving. We like this policy, and most of our readers do too. Nordstrom has apparently had it since they opened in 1901, though most of their competitors were not putting up Christmas trees next to the Halloween costumes back then. Here’s the post in question. A reader sent the original photo to us, saying that he snapped it at his local Nordstrom. The story became popular, and other sites lifted the photo. It resurfaced in November every year, even during years when Thanksgiving was not on the 26th. You see, Thanksgiving has to be on the 26th and Black Friday on the 27th for this poster to make any sense. Thanksgiving is on the 26th this year. It also was in 2009. It’s easy to recognize the version that we originally posted six years ago, though, because you can actually see the photographer’s reflection in the picture. Every year, Nordstrom makes a new poster with the accurate date. People share ours anyway. As far as we can tell, this year there’s been the normal chain of re-posts on Facebook, Twitter, and Imgur. Also, many local news stations shared and re-shared it… based on a post by St. Louis Fox affiliate KTVI from 2012. Oddly, the stations do not acknowledge that the photo is, as far as they know, three years old. We’re not sure why. The date is right there. People shared this Facebook post more than 451,000 times, even though Thanksgiving was on November 22, 2012, and Black Friday on November 23. Nordstrom has the same policy again this year. They haven’t changed it in the last century or so. Yet some local news stations found our picture, and don’t know how to peform a reverse Google search or use TinEye. KPTV in Oregon posted it, a regional site for the Chicago Sun-Times posted it, Digiday posted it, and even ABC News tweeted our six-year-old image and included it in an article on the subject (warning: auto-play video) That’s when readers started submitting it to us. Naturally. To be fair, ABC News does credit the photo. They credit it to the person who they apparently think originally posted it on Twitter: a man who posted it yesterday, and claims to live in Stockholm, Sweden. Nordstrom responded to him on Twitter, which was probably how ABC News found it. @CristobalSGB Thanks for the love and support, Marcus! Hope you and your family have a wonderful Thanksgiving. Mostly, this is all very amusing: we’d certainly appreciate credit for this image that was sent to us originally. The lesson for us was to watermark reader-submitted photos, and now we do. What should the lesson be for our readers? Don’t take everything that you see at face value. In this case, the facts on the poster were true in 2009 and are true this year. However, that isn’t always necessarily the case. The next time that you hit share or retweet or repost something to your Facebook friends, or maybe to a Twitter account with 4.8 million followers, as ABC News has, check it out first.